The 100-m² apartment consists of 2 very spacious bedrooms. The accommodation is ideally located in the heart of the old town, next to the Bartholdi House, in an interior courtyard which is extremely peaceful without any noise. It is located in the very centre of the city, near the shopping facilities. This makes it very easy to go shopping, visit museums, and visit La Petite Venise without needing a car: you can discover Colmar on foot. The apartment is fully equipped with a flat-screen TV, complimentary high-speed Wi-Fi. The luxurious materials give the accommodation a comfortable, warm, and spacious feel. The apartment is also suitable for business trips. "Excellent location, heart of historic town but quiet with secluded courtyard. 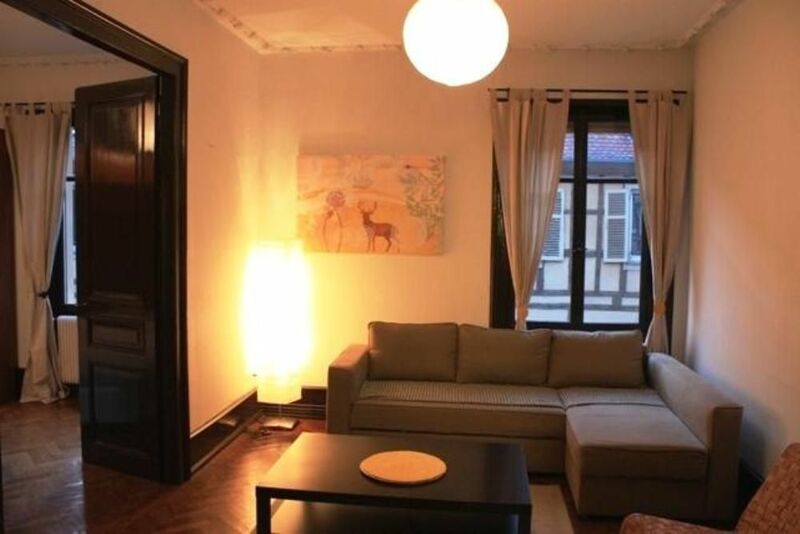 All appliances modern and working, apartment as described, comfortable and well decorated. Kitchen generously supplied with condiments, beverages etc. Carlos and Emilie very welcoming and helpful. Layout might be a drawback if more than 1 couple - bathroom off a bedroom." "We were very satisfied with the apartment and had everything we needed to be comfortable. The location was excellent and we were able to walk around the city easily. " "We thoroughly enjoyed our stay in this wonderful old apartment in the centre of Colmar. Emilie and Carlos are very helpful and friendly owners who have provided for guests comfort with modern fixtures and old world charm. Car parking is close by and easy to access." "The apartment is very clean and modern with quite a bit of construction around it, but it did not affect our stay. Would recommend this apartment to anyone traveling to Colmar. Colmar is a very nice city with lots to do for adults and children." We had a wonderful stay; the apartment is well outfitted and Emilie and Carlos are very helpful. Appartement spacieux, situé en plein centre avec un pass parking. Idéale pour visiter Colmar. Nous avons s passés une excellente semaine, ville magnifique proche de la suisse, l'Allemagne. A pied ou en voiture beaucoup de lieux de découvertes, riche "n histoires et en culture. Deux points négatifs: l'escalier qui donne accès à l'appartement, très raide, il faut monter avec prudence, l'autre le manque de luminosité. Le pass parking est valable en journée de 9H a 21h, le véhicule ne peut dormir au parking RAPP, ce qui demande de trouver une place à proximité de l'appartement après 20h lorsque les accès au centre sont ouverts et le matin de déplacer son véhicule avant 9H, pour ensuite le garer au parking RAPP. Take the A 35 exit to Colmar centre, and then continue to the Parking de la Montagne Verte (old town) for a free parking space. The sleeping accommodation is located 300 metres walking away. Come and discover the Alsace region and its culinary specialities (‘tartes flambées’, ‘sauerkraut’), the vineyards along the Wine Route, the folklore, the numerous and famous Christmas markets (from November 25 until December 31), and the architecture (timber-framed houses). Other interesting sites: Colmar lies at the same distance as Strasbourg, Gérarmer, and Freiburg.